There is quite a bit of buzz about the bees these days. It seems like when we were kids we just co-existed in nature with the bees and all the bugs for that matter. If an unwanted roach showed up we just smashed it with a slippah or a boot. Today just about every store we go to has an entire aisle dedicated to poisoning this or that crawly thing. Then we wonder why our bees are on the endangered species list. Here are a few simple ways we can be more mindful of the bees and other critters just trying to live. It would be great if we could just get rid of the roaches, fleas and mosquitos but since poisons kill indiscriminately we need a better plan. 1. Skip the Pesticides – Spraying to kill some bug that you believe to be a pest while simultaneously killing the ones that are responsible for food to grow, is a horrible plan. 2. Replace Lawns with Food – This is Maui, we need to make the unnaturally green lawn a thing to be scoffed at. If bee killing fertilizer and pesticides is what it takes to have a green lawn, we need to take a closer look at our priorities. 3. Know the Origin of the Plants We Buy – Where are your ornamental plants, succulents and fruit trees coming from. Buy plants from nurseries that do NOT treat plants with neonicotinoids, or other bee killing pesticides. You may want to take a close look when shopping at Home Depot, Lowes or Walmart in particular. Additionally, these plants are coming from who knows where, they could introduce any number of problems in your garden. Buy Heirloom seeds from a reliable source – Rather than buying veggies grown in questionable soil start your own veggies in your own organic soil or compost. Grow flowers with your veggies so the bees can find your garden more easily. 4. Support Conscious Stores – It is time to start supporting stores that refuse to sell products that poison the island. If making a choice between a store that sells a certain weed killer and one that does not, I will always do business with the store that does not (poison the island). We can support the small family hardware store and keep the money on the island. Let’s support businesses that care about the island, the bees, and you. 5. Plant Flowers – Plant lots of flowers and Bee Friendly Plants. 6. Buy Local Honey – again support local businesses and family beekeepers. The local beekeepers bees will be pollinating you Maui grown food. 7. Become a Beekeeper Yourself – Bee keeping is a fascinating and rewarding skill to have. 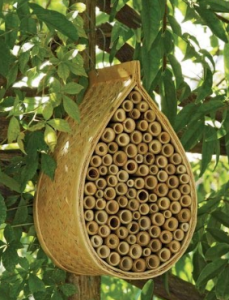 If you do not have the time to go all in with this hobby a simple bee house can be created by placing a some cut pieces of bamboo together horizontally, they are even available for sale on the internet. This would be a great craft idea for someone willing to make these to sell at the farmer’s market! 8. 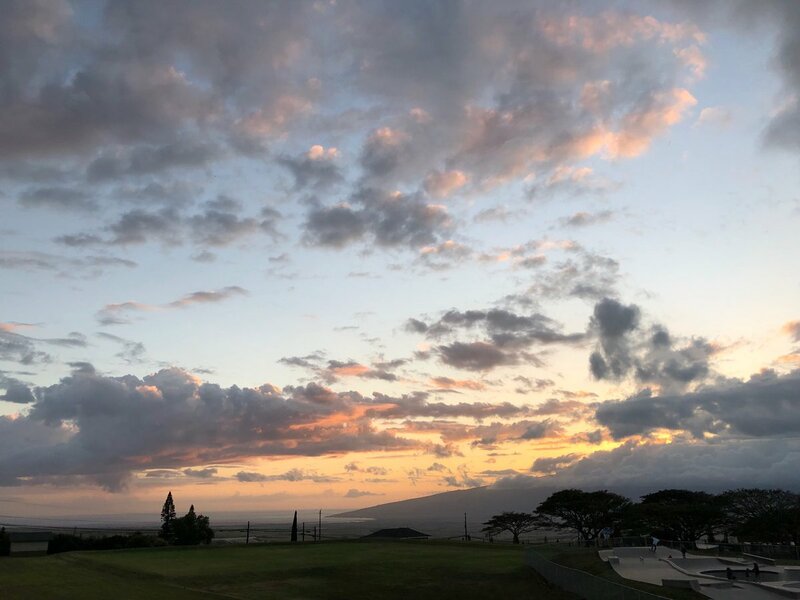 Keep non-local honey away from the Maui bees – Do not make store bought, non local honey available to local bees. This practice can introduce bacteria from foreign bees into our Maui bee colonies. 9. Water the Bees – Bees get thirsty, place shallow dishes with lots of rocks in them for the bees to have a drink. The rocks are there to prevent drowning. The water is for drinking. This can be done in a very creative way, have fun with it. 10. Nurse a bee back to Health – Many times a bee will be found in the house, dehydrated and in need of attention. Mix a tiny bit of honey with a tiny bit of water and offer it to the bee, do this outside because chances are after a couple of minutes the bee will fly away. There is a good chance that this practice will be all it takes to save a tiny life. 11. 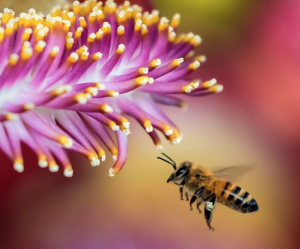 Let the Bees Live – Have a bee professional come to remove any bees that have chosen their home somewhere in your home, when this does not work for you. Never kill the bees. There a a million more ways for humans to protect the bees, I hope you were able to get some good ideas from this list. If you are looking for some really great local Maui honey stop by the Upcountry Farmer’s Market aka Pukalani Farmers Market on a Saturday morning. There is a lot more to say about the bees so keep checking back for more information on this very important topic. Check out local honey from Maui Bees and Maui Bee Farm.